The small propagation kit is designed to include all necessary items (water excluded) growers need to help give up to two dozen seeds or cuttings an excellent start at life. Each kit includes top of the line products that are utilized for personal or commercial use by growers all over the world. The small kit is basic but designed to meet all your essential needs. This is a convenient size that will deliver many beneficial results. Consider these convenience features. Extremely comprehensive and includes high-quality equipment. The process of producing healthy plant roots requires patience and a proper approach. The ability to follow simple rules and utilization of quality equipment can simplify and improve the outcome of the results. Items included in the Small Cuttings and Seeds Propagation Kit are simple in design but complex in delivery. 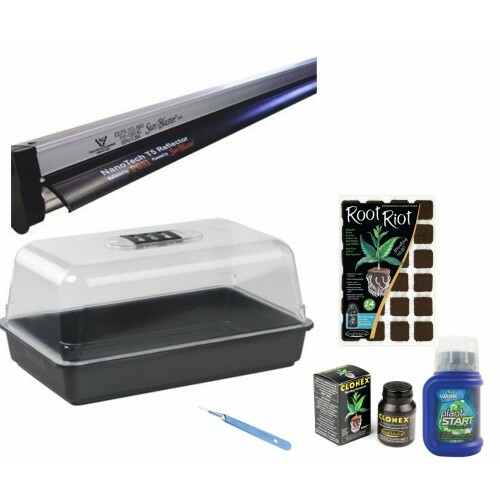 Stewart propagators work to simplify the plant growing process. It serves as a miniature nursery for seedlings as they are placed indoors in a designated area that requires very little space. Seedlings grow best when placed in an environment that is heat, light, and temperature controlled. This environment enhances the conditions for successful growth. 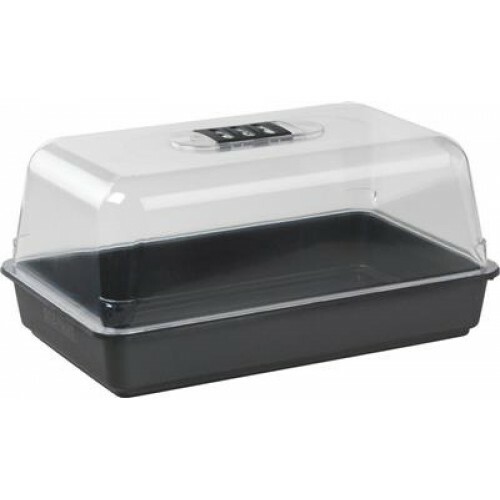 Gardeners and growers find propagators to be extremely helpful in initializing the growth process. Once developed, the small plants can be transferred to a bigger pot or garden space. Lighting is an essential element for plant growth. The SunBlaster T5 is equipped with a Nano Tech reflector. This attachment distributes light deep into the foliage of the plant. It utilizes up to 50% less energy that an average florescent lighting system. Heat production is so low that the Nano Tech can be positioned as close as one to two inches over the canopy of the plant for maximized photosynthetic response. Nano Technology is best described as a developmental process of extreme precision measured on the nanoscale. The SunBlaster Nano Tech reflector was designed with a process that works within leniencies ranging from one to one-hundred nanometres. To provide a relatable example, one sheet of paper measures a thickness of 100,000 nanometres. Prior to exiting the reflector in the form of diffused light, light is absorbed, reflected, corrected and shattered by the Nano Tech metallic crystal inside the reflector. The light in its diffused state covers a wider margin and infiltrates deeper into the foliage of the plant. The crystal coating of the Nano Tech is enriched with dual layers of optical grade reflective film and a protective outer layer. Root Riot Propagation Cubes are made from substances of a composited and organic material. The cubes preserve superlative water to air ratio to promote healthy and prompt growth. This is an innovative product that is ideal for cuttings and seeds. Infusion with biologically active ingredients and micro-nutrients makes it possible for the cubes to assist in the establishment of roots and deliver the appropriate nutrients to plants for sustainable growth. 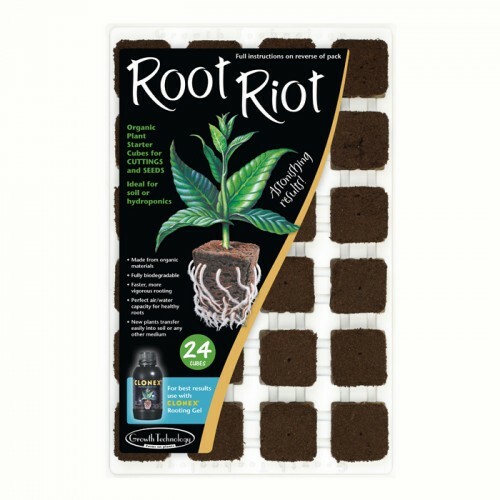 Riot Root Cubes consist of sphagnum peat moss that is uniquely and superbly milled. 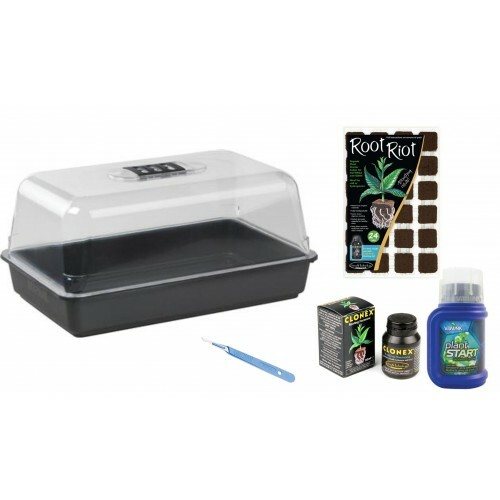 This ensures an excellent starting environment for seed, cuttings, and also acid-thriving plant clones. 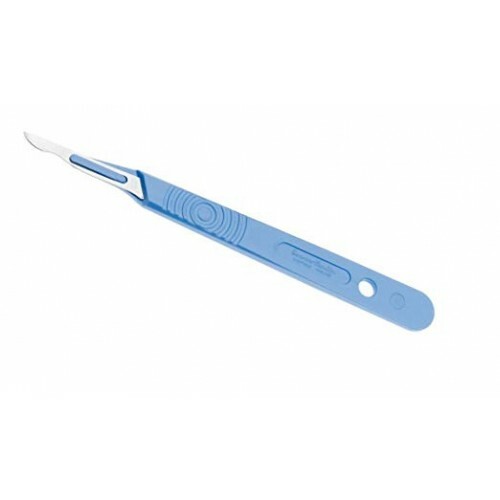 This unique make-up permits the transfer of air, simplified root penetration and remarkable water retention capabilities. This takes place even as the plants are transferred from one growth environment to another. Growers find it convenient that Root Riot Cubes easily work with 50 compartment trays that are included with the system. This system is an exceptional environment for the initiation and development process of roots. Clonex Rooting Hormone Gel is utilized across the world in private and commercial gardens. Clonex is a superior quality product that has been used all over since 1989. 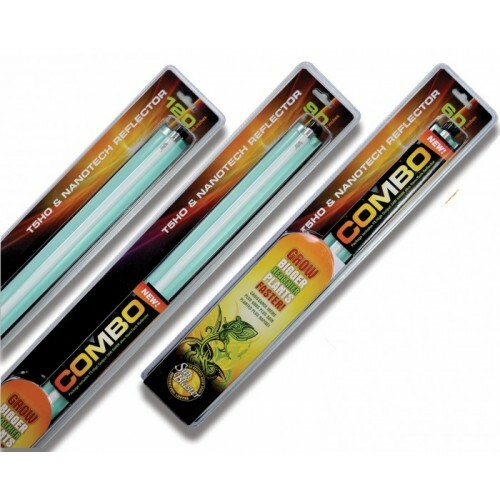 The high-quality gel places a strong and reliable seal around the stem of the plant. It works to provide essential hormones that are needed for prime root development. The gel also provides some of the necessary nutrients that protect the growth of new tissue. Clonex Rooting Gel can be used on a variety of cuttings such as herbs, fruit, vegetables, flowering plants, woody plants, and many more. It serves as a great source of hormones, nutrients and vitamins that plants require. Vitalink Plant Start is designed to greatly improve the root development of cuttings and seedlings throughout the initial stages of growth. It consists of the vigorous macro and micro nutrients that are necessary in the initial developmental stages. This feed consists of a specialized proportion of boron and calcium mixed with B1 vitamins and hamates to expedite growth and motivate more rapid and healthier rooting times. 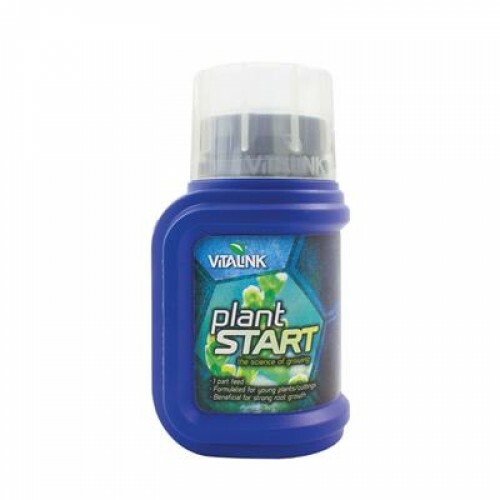 The use of Vitalink Plant Start presents a foundation for healthy development during the initial stages and also aides in the prevention of infection and disease in upcoming stages of the life cycle of plants. Stress is reduced because of the B1 vitamin. The vitamin also helps to gain the nutrition necessary to help them resist common diseases that occur in plants. This permits them to have a healthy start at life as cuttings and seedlings. The small cuttings and seeds propagation kit ensures that your plants have a great start in life and the opportunity to grow into beautiful adult plants. Easy Rolls are very easy to set up you simply suspend them from the hooks provided or some of your o..
Clonex Mist Clonex is a quality brand renowned throughout the industry for the effectiveness of..
Lighthouse Clone 1 Tent 0.7 X 0.5 X 0.9mLighthouse Lite Clone 1 Tent can be used as a propagat..